It would be a dissapointment if that building wasn't redeveloped as its a dog. As for another cocktail bar...... Is it only Cardiff that grabs on to the latest trend and then does it to death (see burger restaurants) or are all cities the same? It's just the same in every City isn't it. Apart from Newport, they grab onto the latest trend ten years too late. Seems to be a fair bit happening at the moment with various bars etc planned for opening. Just off the top of my head the Libertine is in the process of being kitted out (old Barbucci unit in High St). The previous Nat West bank in St Mary street now has scaffolding up and is in the process of being coverted into the Alchemist. What was Clive Ranger (corner unit of Castle Arcade facing High Street) is being kitted out to provide a 'raw press' during the day (whatever that is) and cocktails in the evening. Ten feet across the arcade Barkers Coffee are planning on opening in the evening as a cafe bar. Right next to Barkers is a place called No 23 (used to be Floyds clothes shop many moons ago) which sells coffee etc in the day and is a cocktail bar by night. It also looks as though the Tair Pluen is reopening. The outside is being painted and there is an application in for new signage (this is the bar connected to the Owain). I have no doubt that it will be billed as a craft beer place with artisan pints from £4.50 upwards. And then there is an application for another cocktail place in what was Cafe Atma (prior to that Positano's) in Church Street. I was hopeful that this building was on detah row and there was a planning app for redevelopment but I assume that the owners have had a change of heart/run out of money. NorthCityBoy wrote: It's just the same in every City isn't it. Apart from Newport, they grab onto the latest trend ten years too late. I rarely go into town but I had a night out a few Mondays ago. I played a few games of table tennis in Kong, watched Arsenal cheat West Brom in O’Neills and then my mate suggested Coyote Ugly. It was free to get in and quite busy by midnight. The drinks are cheap and while I’m not really into leering at young women while they dance on a bar, dozens of men and women seemed to absolutely love it. In these days of “progressive” and identity politics, where political correctness is blitzing longstanding, formerly-accepted activities and discourse, it was very refreshing to see middle-aged lesbians being admonished and restrained by the male door staff for getting too close to the nubile dancers. Oh I dunno. Newport always seemed more likely to pick up trending things early. Well they used to anyway. They were more successful on attracting bands, had a better reputation for nightclubs at one time and chains like Yates', Edwards, etc were in Newport way before they were in Cardiff. Does anybody know what's going in the unit at the base of southgate house - used to be coach hols. Given its proximity to additional thousands of workers in 2-3 years and on the edge of new public square I'm thinking probably coffee but could be a bar? restaurant? Crafty Devil Brewing (from Canton) are opening a City Center bar on High Street by February, I believe in the old Games Workshop. Going to be called Beelzebub. They are looking for crowd funding for it too. A Bar has just popped up that looks like its been there for a century! 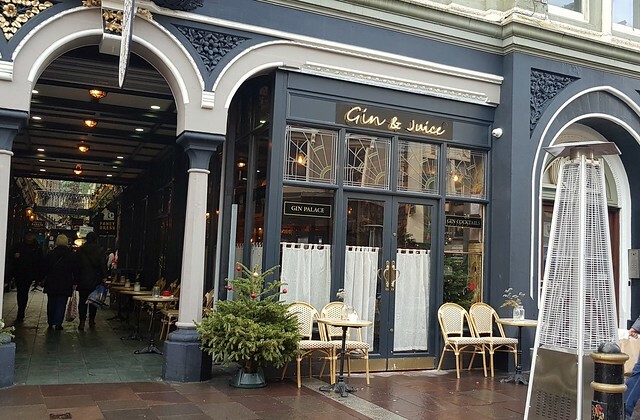 it's Gin & Juice which is another gem from Barker who have that wonderful coffee shop in Castle Arcade. It's pretty narrow but that just adds to its cosy appeal. I only popped in to have a quick look at this rustic treasure and was gutted that it was a bit early to really take in its charm - hic! The Gent behind the bar was very friendly and wised me up about the place - It's only been open for a week and it specialises in Gin, oh and Juice, but draught beers also available. Gotta pop in soon for a couple - not gin mind!! So this is another fantastic addition to this great arcade, I reckon Castle Arcade is worth a visit to Cardiff city centre on its own!! Gin and Juice is the latest part of the Barker empire. I've not seen it in person yet but, from your photograph Paul, it really does look fantastic. I'm also very much looking forward to the new Crafty Devil bar, which probably sounds more like the sort of place that I'd like to go for a drink. It's been great to see a growing number of small, independent bars (along with smaller chains such as BrewDog) opening in town over recent years, bringing much more choice for more discerning customers. We're also getting seeing places like Curado and Bar 44 doing really well. It's strange to think that 15-20 years ago huge warehouses like Walkabout, offering crap lager, chart music and vertical drinking culture seemed like the future. Whilst we have lost some old pubs that I do still miss, like the Park Vaults, I think Cardiff city centre today is a much more interesting place for a night out. Hopefully we will continue to grow this culture of smaller independent bars and restaurants, along with the music scene. One thing that's still missing, from a personal point of view, is a pub with a really good jukebox.